Retailer Graveyard » Retail Categories » Fashion, Shoes, Accessories » Robert Hall Clothes Inc. It was an American clothing retail company based in Conn. 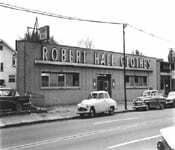 In July 1977 the Robert Hall parent company United Merchants and Manufacturers filed for bankruptcy and all the Robert Hall stores were closed.